This is the kitchen ~ which I LOVE! 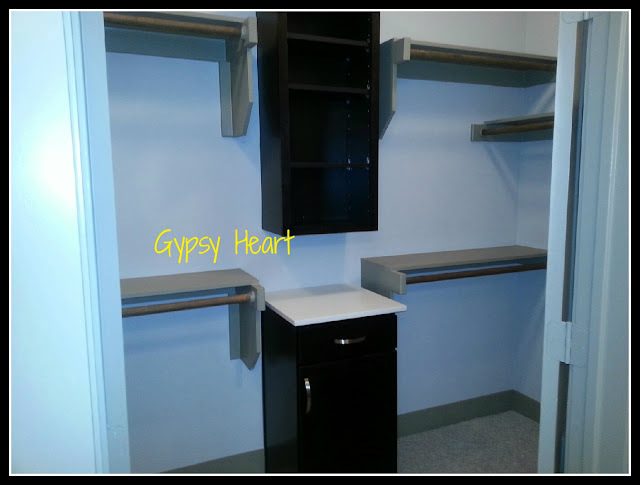 Pantry is on the left. Not sure if you can see but the cabinets on the far right have glass fronts. Neat, huh? Stainless steel appliances. The cook top is glass, side by side refrigerator and the sink here and in the bathroom are drop in. The faucet is the shower type...move it around for cleaning, etc. 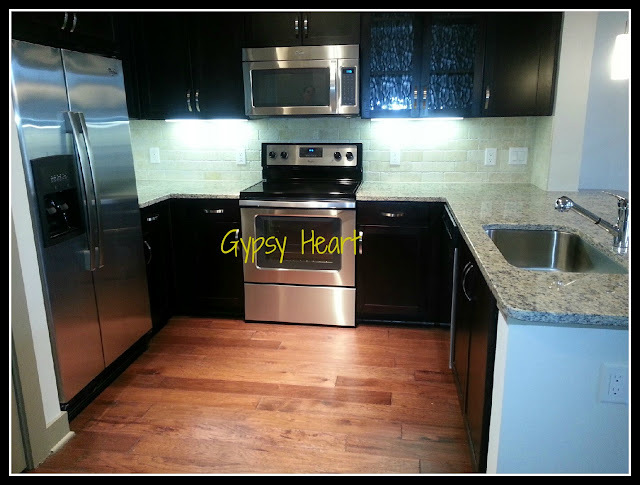 Counter tops are granite, beautiful back splash and under counter lighting. A little different view...the bar on the other side of the sink is awesome! This is the living room. Looks smaller with this view and the paint does not show up well. The entire space is a greyish tone, not the taupe reflected. The doors open onto a balcony. I know I took a photo of the bathroom but cannot find it. Missed out on the bedroom, laundry area, etc. My mind was racing and like I said, it was a rainy, cloudy day. Can't wait to show you more! You won't believe the pool, lap pool, cabana areas, the workout room, etc. Yes, it's smaller than where I am now but that's ok. I'm paying for extra space now that I honestly don't use or need. I know many of you have spacious homes, however, as a retiree I don't "need" that nor do I want to care for it. I want life to be calmer and peaceful...certainly away from the noise here, the leaks and all the other problems I've encountered. I am continuing to declutter, toss and donate. Really is a wonderful, lighter feeling! I'm imagining the decor for the new space. I want an accent wall in the bedroom painted navy ~ I have a deep teal now. I'm collecting gold framed mirrors for that wall and I want bright and happy in the bathroom! My headboard is white tufted velvet and the bedding is yet to be determined. Thanks again for all your good thoughts, prayers and kind words! Will keep you posted as I go and I will take more photos when I can. It looks beautiful, Pat! So happy for you. I knew you'd find a place you'd love, Pat. What a great feeling to know that in a very short time, you'll be here! I am so happy for you, Pat! I wish you a stress free move and many happy ever afters in your new place. It looks lovely! OH, so excited for you! A lovely home! WOW! That is absolutely gorgeous, Pat! I'm so excited for you and bet you can't wait to move in! How exciting! 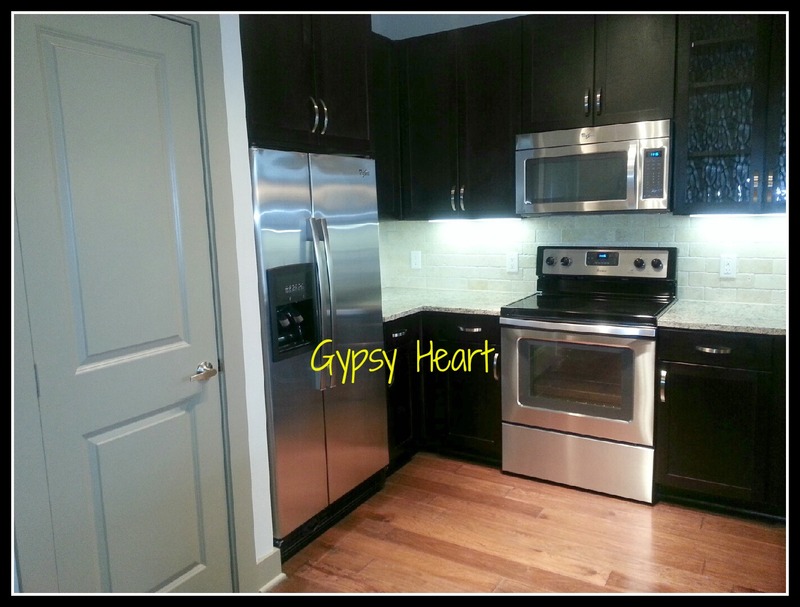 I love the beautiful hardwood floors in the LR and the stainless steel in the kitchen. This is very neat. Happy for you! Pat, your new home is gorgeous!! Everything is so fresh and new. I love the contemporary style and those floors are amazing. I'm so happy for you! Pat...what a beautiful new home for you! I am sure it will feel great to be settled! Looking forward to seeing your new nest once you are settled! Your bed sounds dreamy...Happy Saturday! How exciting, Pat! I'm so glad you found a place that you love. You are going to have so much fun decorating! I hope the neighbors are calm too. I'm so happy for you, Pat! I can tell how excited you are and everything looks wonderful. I like smaller spaces better, too. My home is small and now that I am well on my way to de~cluttering, I love it even more. Oh, it is just gorgeous! I would love having a pool and fitness center...the kitchen is beautiful and I want to see what is outside those French doors! How wonderful for you! The new place looks great! 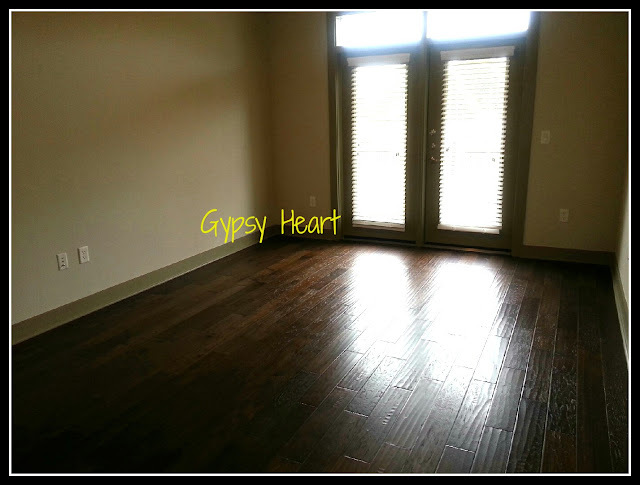 Those wood floors look a lot like mine. I've ALWAYS wanted a laundry chute. :) I just thought that would be so neat and convenient. Here's to wishing you a pleasant, calm, and stress free move. That kitchen is beautiful! Oh, I love the ideas you have for your bedroom. It's going to look gorgeous! Congrats on your new home. Those doors opening on to the balcony are gorgeous too - filling it with flowers I hope? It's beautiful Pat! How exciting, I can't wait to see what you do, your bedroom plan sounds gorgeous!